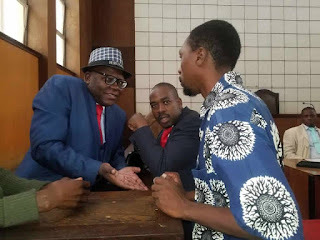 HARARE East MP Tendai Biti (MDC Alliance) on Tuesday survived losing his parliamentary seat after he was convicted by Harare magistrate, Gloria Takundwa and ordered to pay a $200 fine, which he paid in five cent bond coins to escape a week-long imprisonment. Leader of the opposition in the National Assembly, Thabitha Khumalo yesterday told NewsDay that Biti was not going to lose his seat because Parliament rules stipulate that an MP loses their seat if they are imprisoned for at least six months or if they fail to attend sittings for 21 consecutive days. “Section 129 (1) (i) (ii) stipulates that a member can lose their seat if they have committed and offence and sentenced to imprisonment for six months or more without the option of a fine or without the option of any other non-custodial punishment, and therefore Biti cannot lose his seat,” Khumalo said. However, she said her party was seized with the issue of three other legislators – Charlton Hwende (Kuwadzana East), Godfrey Sithole (Chitungwiza North), and Joanah Mamombe (Harare West) – who only have nine parliamentary sitting days left for them to show face in the National Assembly or lose their seats. She said she had written to the Speaker of the National Assembly Jacob Mudenda, seeking their protection so that they can attend to parliamentary business, but her letters have not been responded to yet. Khumalo said MDC Alliance MPs were being treated unfairly, adding she now hoped that the three MPs in hiding will turn up in the House before the grace period lapses. “I wrote to the Speaker and he has not responded yet, but I am still hoping that he will respond soon because the three MPs can lose their seats if they absent themselves for 21 consecutive days,” Khumalo said. “The three have to bite the bullet and make a decision – either to come back and face arrest – and hopefully, they will be judged fairly through evidence and not speculation, and hopefully, they will not be beaten up or tortured,” she said. Khumalo said she suspected a ploy to deplete the number of MDC Alliance MPs in Parliament where three others – Settlement Chikwinya (Mbizo), Llyod Dzikamai Mukapiko (Redcliff) and Matabeleland North Senator Rosemary Nyathi – were taken to court for allegedly inciting the January 14 to 16 demonstrations. Nyathi has since been acquitted, but Chikwinya and Mukapiko are out on bail and last week they attended Parliament sessions. “I am gutted because, as leader of the opposition in the House, I seem to be fighting at all fronts without recourse because all MPs have rights and immunity, but it seems opposition MPs are not being protected.